Action-based research was conducted in a pre-school class to determine whether an increased emphasis on multicultural activities across the curriculum would increase children’s positive socialization behaviors; increase parent involvement; and improve the class’s Early Childhood Environmental Rating Scale (ECERS) relative to diversity. Following implementation of a variety of multicultural activities, significant increases were noted in the children’s prosocial behaviors. ECERS ratings results will be determined at a later date. No significant increase was noted with parent involvement. Young children tend to reflect the attitudes and prejudices of their parents and/or primary caregivers. Children as young as two years have been known to tell other children that they cannot play with them because they (other children) are not the same in appearance. Additionally, childcare centers that are attempting to be accredited by the National Association for the Education of Young Children (NAEYC) are regularly evaluated by the Association and must undergo an Early Childhood Environmental Rating Scale (ECERS) as well. Both the NAEYC criteria and the ECERS are specifically looking for evidence of activities promoting the acceptance of diversity, and it is an area of weakness in many programs. The purpose of this study was to determine whether an emphasis of multicultural activities for preschool-age children across the curriculum would achieve the following objectives: show an increase in positive socialization behaviors among the children; increase parent involvement in the program, thereby educating the parents and their children in the acceptance of diversity/multiculturalism; and show an increase in the ECERS score related to diversity. According to the U. S. Census Bureau (2002) there are approximately 5,321,993 people living in the state of Maryland, with 368,975 of them being children under the age of five. There were 83,975 children between the ages of three and five enrolled in recognized preschool or nursery school type programs. These figures represent at least 13 racial/ethnic groups plus combinations of races and ethnicities within families. In addition, Maryland has a reported foreign-born population of about 601,332, with 561,243 speaking English less than “very well.” In the face of such numbers, which are increasing with time, the inclusion of multicultural activities should be reflective of the population being served. Play is how young children learn and assimilate new things into what they already know. According to Levin (2000) children learn about diversity through play, including music, clothing, foods, games, celebrations, and dramatic play. This approach also supports the ecological systems theory in terms of culture and its effects on children by beginning with the home lives of the children. Engaging in activities that represent the home cultures, all of the children are able to “…learn new concepts, explore new attitudes, and develop new skills” as well as “…learn more about each other’s families and diverse backgrounds” (Levin, 2000). Essentially, cultural awareness begins with learning about self, which will help children to overcome any barriers to diversity (Kirk & Anicich, 1996). The impact of culture on learning and behavior is natural and must be recognized through inclusion of appropriate activities and knowledge of a child’s cultural background (McIntyre, 1996). This statement is supported by Bronfenbrenner’s Ecological Systems Theory (1977), (Krail & Cavanaugh, 2000, p. 23 & 24; Paquette & Ryan, 2001). 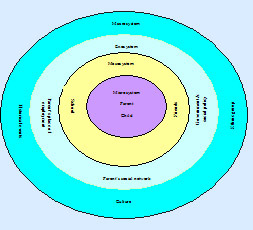 Figure 1 looks at child development within the settings of distinct “systems; the microsystem, mesosystem, exosystem, macrosystem, and chronosystem. These systems begin with what is closest and has the most impact on the child and expands outward to include the global environment and time. Children’s literature offers a multitude of multicultural stories, which can help integrate the multicultural aspects into all areas of the curriculum. Family involvement is key to making the multicultural curriculum meaningful to children (Moore & Deman-Sparks, 2003; Quitero, 2004). When selecting multicultural stories, it is essential to choose stories that the children can relate to in order to use it as a springboard for further discussion (Moore & Derman-Sparks, 2003). The population for this study was the researcher’s preschool class. This class was in a center that required exploration or utilization of additional measures to increase multicultural education in order to improve their ECERS rating. This study began with the administration of a parent survey to learn more about the cultures of the families of children in the study group and to gain input from the parents about their current knowledge of multiculturalism. After the parent surveys were returned to the researcher, a parent workshop was conducted on the meaning of multiculturalism. A post parent education survey was administered following the workshop. Based on input obtained in the surveys, the regular curriculum for this class was modified with age-appropriate activities. Observations of the children’s social interaction were conducted before and after the multicultural curriculum was implemented. These observations were in the form of anecdotal notes, checklists of specific behaviors, time samplings of interactions, and tallies of social and prosocial behaviors. Socialization Behaviors Among the Children: A frequency count was used to show change in the socialization behaviors among the children studied. Children were observed at play and a tally mark was placed next to each child’s name as a prosocial or antisocial behavior was observed. These behaviors were defined as follows: Prosocial—helping, sharing, hugging, and calling a child by a kind name. Antisocial—hurting, hoarding, bad-name calling, and rejecting another child. Observations were conducted one month apart; the first prior to the implementation of the expanded curriculum and the second following it. Although the antisocial behavior increased slightly (23%) during this period, children’s prosocial behavior increased substantially (177%). Parent Survey Results: Twenty families were invited to participate in the Parent Survey prior to the Parent Workshop on multiculturalism. Seven surveys (35%) were returned to the researcher for evaluation. Eighty-four percent of the surveys were completed by women and 14 percent by men. The majority of the participants were between ages 18-45 (84%). Caucasians constituted the largest group of participants at 57 percent, and African Americans made up 29 percent. Of these participants, 43 percent reported that at least two other ethnic groups lived in their community, 29 percent reported at least one, 14 percent had four or more, and another 14 percent had three or more ethnic groups living in their community. 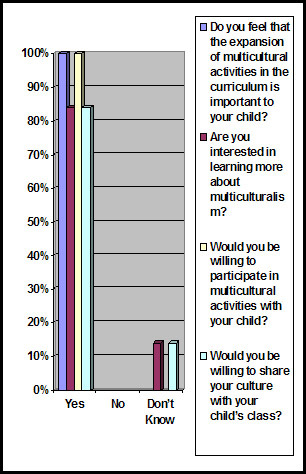 When parents were asked if they felt that expansion of multicultural activities in the curriculum was important to their child, they unanimously said yes. Eighty-four percent said they were interested in learning more about multiculturalism, and all were willing to participate in multicultural activities with their children. Eighty-four percent were willing to share their culture with the class. Activities for which parents were willing to share in the class included: preparing a recipe related to their culture (70%); reading a story related to their culture (42%); and sharing a tradition or activity related to their culture (30%). 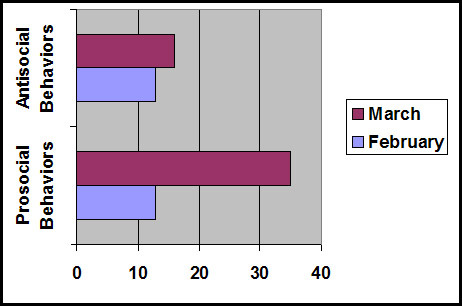 ECERS Score Related to Diversity: The rating received in the classroom that was the object of this study was 4 out of a possible 7 points, the lowest score of this classroom’s complete evaluation. The comments written by the evaluator were as follows: book materials do not represent differing abilities; lack of multicultural materials and activities; lack of parent involvement in this area; and minimal non-traditional stereotypes. This study showed a significant increase in the children’s positive socialization behaviors. Parent involvement on the other hand, did not increase by a measurable amount. The parent workshop offered families a free meal, free childcare for the duration of the workshop, and a specific time limit of one hour. Several parents who signed up for the workshop did not show, and those who did not sign up, when asked for a reason, either did not offer an excuse, were not interested, or said they were too busy. Unfortunately, the ECERS was not re-evaluated during this project period due to circumstances beyond the researcher’s control. However, the steps taken to improve this score were those recommended specifically by the evaluator and should lead to an increase in this score. This research demonstrated that the most difficult objective to achieve was parent involvement. Increasing parent involvement might be improved if the workshop was offered more frequently and if a guest speaker who is knowledgeable and known to the parents was engaged to lead a portion of the workshop. Kirk, Rea, & Anicich, Maggie. (1996). Dropping the barriers in kindergarten: Cultural awareness. Journal of Instructional Psychology, 23 (4)312. Krail, Robert V., & Cavanaugh, John C. (2000). Human development: A Lifespan view, 2 nd edition. Belmont, CA: Wadsworth/Thomson Learning. Levin, Diane E. (2000). Learning about the world through play. Early Childhood Today, 15(3) 56. McIntyre, Tom (1996). Does the way we teach create behavior disorders in culturally different students? Education and Treatment of Children, 19(3)354. Moore, Thomas, & Derman-Sparks, Louise. (2003). Giving children global views. Early Childhood Today, 18(3)40. Quintero, Elizabeth P. (2004). Will I lose a tooth? Will I learn to read? Problem posing with multicultural children’s literature. Young Children, 63(4)56.